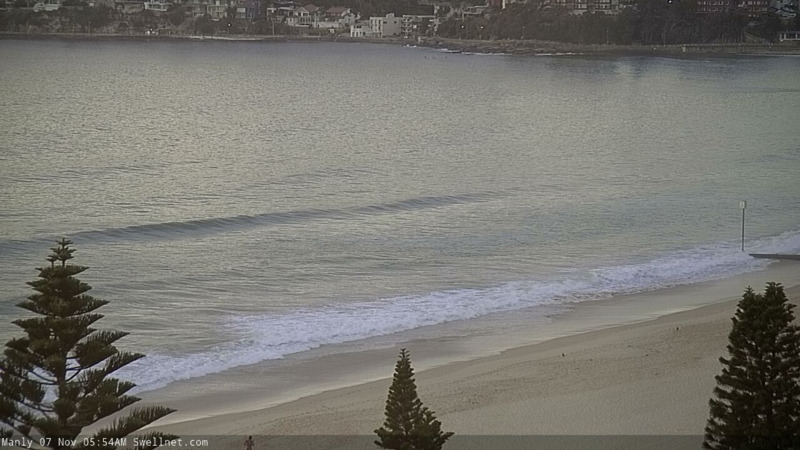 Best Days: Fri: easing S'ly swell and early light winds. Next week: slowly building E/NE swells. Recap: Lully though workable residual swells have provided small options over the last few days, maxing out around 2-3ft out of the south on Tuesday, with smaller surf today (though some beaches picked up a minor pulse into the afternoon). There’s also been a small level of NE swell in the mix today too. Winds have been generally light so conditions have been clean throughout this period, the only point of difference was a brief moderate S’ly change mid-morning today that ruffled up the open beaches for a few hours, but has since eased back to become light and variable. A second, stronger gusty southerly change is moving up the South Coast, with Ulladulla now gusting 21kts (also picking up 22mm of rain, and counting). It’ll reach Sydney tonight and then provide fresh southerly winds across all coasts through Thursday. A reasonable fetch trailing the change will build short range southerly windswells to 4-5ft at south facing beaches, though surf size will be much smaller at beaches not open to the south. We may see one or two regions pick up an early SW flow, but the overall conditions across the region won’t be especially favourable so it’s unlikely there’ll be any great waves on offer. Winds will ease into the afternoon, though conditions will remain below par. Friday looks like a better day for a surf. Thursday’s southerly windswell will ease back, to be replaced by a smaller mid-range S’ly groundswell originating from the parent low to the approaching front (currently pushing underneath Tasmania). South facing beaches should see inconsistent sets in the 3ft range, though once again it’ll be much smaller away from these locations (except the Hunter, which should see a few bigger bombs). A weak high pressure system will create light variable winds through the morning ahead of freshening afternoon sea breezes out of the NE, so aim for a morning surf for the best waves. In Monday’s notes I mentioned a couple of peripheral synoptic systems that had low potential for weekend waves. Unfortunately, the models haven’t improved their outlook relative to our region, so it’s looking like a very small weekend of waves ahead. However, another system mentioned for early next week has broadened its scope and slightly sped up in its timeline since Monday's notes were prepared. That is: a trough in the southern Coral Sea is expected to slip to the south, and whilst we may not see a classic E’ly dip form in our swell window, we are looking at a broad region of easterly winds through the northern half of the western Tasman Sea. Saturday is likely to see small, easing residual swell from Friday, with mainly light winds and NE sea breezes. We may see a flukey long range S/SE swell clip the coast, originating from a secondary intensification of the low responsible for Friday’s south swell, as it approaches New Zealand - but this is really clutching at straws. It’s best to expect very little surf, and be pleasantly surprised if it exceeds expectations. Sunday morning will also start small, however may see the first few signs of building E/NE swell during the day - I’m not expecting much size but it’s quite possible that exposed beaches could pick up occasional 2ft+ sets throughout the afternoon (more likely late in the day). Similar winds are on the cards as per Saturday; light and variable with NE sea breezes. Let’s take a closer pass on Friday. Looks like we’ve got an extended period of E/NE swell as a blocking pattern sets up camp, and a series of tropical systems track southwards from the Vanuatu/Fiji region, pushing up against a large high near New Zealand. As a minimum this should create a slow building E/NE trend all week courtesy of a broad though ultimately moderate strength ridge through the Tasman Sea, however there is also the potential for one of these tropical systems to reach Tropical Cyclone strength in our far NE swell window. And that’s an exciting thing for early November. 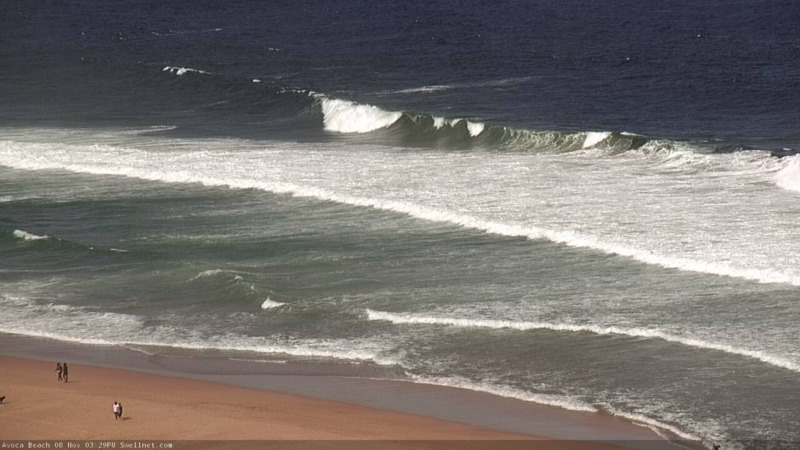 Thick lines of south swell pushing into the Cenny Coast this arvo. Reckon it’s gonna tank by tomorrow morning Ben?